Rosslyn Heights, formerly number one Rosslyn Gardens, opened by Sir Geoffrey Finsberg, MBE, JP, MP on 23rd September 1987. Rosslyn Gardens, the red-brick mansions on the northern side of this road (now nos. 4-26 Belsize Lane) was built about 1881. In our photo you can just see the "Rosslyn Heights" at the top of the wrought iron gates. This is nicely done (though there is something odd about the "G"). Finsberg was the MP for the area at the time that he opened this building as "Rosslyn Heights" but we cannot discover what went on in the building. Presumably it was some sort of community activity. 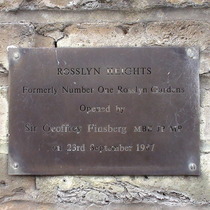 Now "Rosslyn Heights" seems to be estate agent speak for this smalll area of Hampstead. Conservative politician. Born London. Died Stockholm, there making a speech.